Britain’s most powerful civil service mandarin is trying to ‘sabotage’ an attempt by David Cameron to restrict his growing empire, it was claimed last night. Sir Jeremy Heywood was accused of a Sir Humphrey-style attempt to ‘dodge’ new rules that the Prime Minister decides who gets top civil service jobs. The row comes amid fears that the unelected official is now the most important person in the Cabinet after Mr Cameron and the Chancellor. Sir Jeremy, 52, has even been described by one ex-Tory aide as so powerful that he has the Prime Minister ‘by the balls’. A former civil service aide to Tony Blair, said he was nicknamed ‘Sir Cover-up’ after preventing the Iraq War inquiry from seeing letters between Mr Blair and George W Bush in the run-up to the war. Now the Cabinet Secretary, he is accused of a bid to thwart Mr Cameron’s efforts to reduce his and other top mandarins’ influence. Under reforms which were agreed two months ago, the Prime Minister will get the final say on appointing senior Government posts, instead of the Civil Service Commission. The move has been condemned by civil service unions, amid concern from Ministers that some top mandarins are blocking or obstructing Government policy. But Ministers privately claim that Sir Jeremy is already trying to get round that by ensuring his favoured candidate Melanie Dawes lands the coveted £190,000-a-year job as the next permanent secretary at the Department of Communities and Local Government. The Tory Party will be subject to the will of the electorate in May 2015 – The brutality of their actions in the last 5 years will, if there is any justice result in their removal from office. But Sir Jeremy Heywood, assisted by a group of senior civil servants reporting to him will remain in post waiting to bend the knee to the next government. This is the same team that gloated about the role they discharged in the referendum campaign: devising, plotting, orchestrating and delivering against the Scottish electorate a sustained and vicious litany of lies forming part of a “campaign of fear” designed to plant seeds of doubt in the minds of Scots driving them to vote in favour of retaining the Union. In the last year I have posted articles providing information about Sir Jeremy Heywood and his involvement in the affairs of government much of which makes for diturbing reading. The civil service based at Whitehall is beyond the control of government and it’s power needs to be curtailed otherwise things will go from bad to worse. Errors attributable to Whitehall civil servants have cost the taxpayer in excess of £100 billion in the lifetime of the present government. The civil servants responsible have been punished with promotion in just about every case. Two years ago, a photograph of the 1987 Bullingdon Club emerged. It showed a bunch of elegant, arrogant and carefully coiffured teenagers wearing tailcoats and bow ties; it seemed like a curious snapshot from Britain’s high Victorian era. So it was a shock to discover that this photo was in fact taken in the mid-Eighties, a time more synonymous with Wham!, Beverly Hills Cop and the miners’ strike. If you looked closely, you recognized the blond seated in the front row staring defiantly into the camera as Boris Johnson, the mayor of London. Look harder, you’d spot the man most likely to be leading the country next year: David Cameron, a handsome youth staring dreamily into the distance. But what was the Bullingdon Club? What drove the generation that spawned today’s two most powerful Conservative politicians in the country? And how had they been shaped by a background of Eton, Oxford and secret societies? In Washington we tracked down U.S. political consultant Frank Luntz, who helped Johnson gain the presidency of the Oxford Union and years later worked on Cameron’s Tory leadership bid. Luntz witnessed the extraordinary birth of Johnson the Machiavellian politician. Aware of how unfashionable it was to be a dyed-in-the-wool Tory, and having failed to win the presidency once, Johnson presented himself as an environmentalist and even let it be known that he was aligned with the then-popular Social Democrat Party. ‘I’d never seen anyone speak like him,’ said Luntz. ‘There was a candid quality to him. I initially thought it was an act, because I’d never seen it in anyone before.’ Johnson thrived at the Union but he also coveted the presidency of the Bullingdon, which would have given him the ultimate stamp of social approval. Three of the boys in the 1987 picture had titled parents, and Cameron is fifth cousin twice removed from the Queen. But in spite of his ‘poshest chap in the land’ schtick, Johnson is not so well connected. He’s a scholarship boy from a bohemian background, and while he was reportedly always at the heart of ‘the Buller’, he never won its presidency. Luckily he was a very bright boy and his father, Stanley, was always extremely zealous in seeking out scholarships and prizes for him, without which Eton, Oxford and the Bullingdon would have proved out of reach. At Eton he shone brightly but also gained a reputation for complacency and procrastination. Cameron, two years behind him, would have been aware of Johnson but this awareness is unlikely to have been reciprocated. At Oxford the two again crossed paths – and this time Johnson must have become familiar with the future Tory leader. From the beginning, the Club’s name was synonymous with excessive drinking and a competitive destructiveness, and membership has always been by invitation only By getting elected into the Buller, Johnson pulled off another feat of social climbing and, once in, he threw himself into the ritualized drinking with gusto. Drunken destruction was a trademark of the Buller and trashing bedrooms was the standard form of initiation. Radek Sikorski, now Poland’s Foreign Minister, recounted an extraordinary story of Johnson leading a troop of Bullers into his room in the dead of night. ‘I was awoken from a deep sleep by a dozen men in tailcoats, who smashed up my furniture, books, hi-fi, everything,’ he said. ‘I was completely dazed. Then Boris shook my hand and said, “Congratulations, you’ve been elected!”‘ Johnson (whose nickname at Eton had been ‘the Berserker’) was the quintessential Buller. But Cameron was harder to pin down – more likely to shirk than ‘berserk’. Photos from the time show him to be an elegant man, and a touch aloof. We tracked down one of his Oxford girlfriends, Francesca Ferguson, to her home in Switzerland. ‘He was a tall, intelligent, fit guy,’ she remembers. ‘I fancied him!’ She said that one time she brought him home to meet her father and her German mother. Cameron gave them a Monty Python record, which, unbeknown to him, included a famously bad-taste Hitler and Goebbels sketch in which the two Nazi leaders have taken over a B&B in Minehead after the war. When Francesca’s family insisted on immediately playing the record, Cameron apparently doubled over in embarrassment. Yet somehow he was able to charm his way back into the family’s affections so nimbly that Francesca’s mother predicted his political rise. ‘My mother said to me, “He’ll be Prime Minister one day…” In fact she thought the episode was hysterical, and still does.’ No one else suspected Cameron might one day be PM. According to his best friend at the time Giles Andreae, better known as creator of the best-selling ‘Purple Ronnie’ cartoon character, Cameron was hard-working but showed no interest in politics. They spent most of their time on the sofa watching daytime TV. ‘We’d watch Neighbours and Going For Gold, and then go for a pint and a game of darts once we’d finished our work,’ he said. Johnson and Cameron’s political rivalry is every bit as defining of the next ten years as was the Brown-Blair one of the past decade Cameron had almost been thrown out of Eton for smoking cannabis. Perhaps it was this drug-related scrape that meant he kept his head down at Oxford. Or perhaps he just had a blood-borne assurance that he belonged to a grander narrative. As he prepared to leave Oxford with his First in PPE he applied for jobs in banking and management consultancy..and the Conservative Research Department. Nat Rothschild and best mate Jo Johnson Getting a grip on things. A general election throws up many opportunities. Ever since one certain flamboyant blond became London Mayor, speculation has been incessant (and, of course, regularly fuelled by the man himself) that it wouldn’t be long before a Johnson moves into No 10 Downing Street. But few people expected that rather than Boris Johnson himself, his little-known younger brother, Jo, would get there first. Indeed, the 41-year-old’s appointment as the head of David Cameron’s policy unit took most people in Westminster by surprise. The promotion of the old Etonian (‘Johnson Minimus’ in the posh school’s parlance), an MP for only three years, was the idea of Chancellor George Osborne. Apart from harnessing Jo’s strategic skills in a bid to make the Tories more popular, the move is seen as a mischievous ruse to rein in Boris, who makes no secret of the fact he wants to succeed Cameron as Tory leader. The thinking is that if his brother is part of Team Cameron, Boris won’t want to be seen as a critic. This is a classic piece of Osborne devilry. As a colleague says: ‘He hopes that although Jo’s presence in Downing Street will wind up Boris, it will make it more difficult for him to criticize the Government.’ But it is a huge gamble that could easily backfire – not merely for political reasons but also because of the fact that family loyalty is a double-edged sword when it comes to the Johnson clan. For not only are they fiercely competitive with the rest of the world, they are fiercely competitive with each other. Indeed, cradle-reared competitiveness has been a hallmark of Johnson family life. So a great danger for Cameron and Osborne is that little Jo’s appointment will consume big brother Boris with jealousy and propel him to even more Machiavellian tactics to muscle his way in to No 10. Indeed, many Tory MPs believe that Jo is more likely than Boris to become Prime Minister. One backbencher says: ‘He’s is brighter than Boris, he’s nicer than Boris, he’s got less personal baggage than Boris. It could be David and Ed all over again.’ Although politically inexperienced, Jo is undoubtedly very clever, with a first-class degree in Modern History from Oxford as well as two further degrees from European universities. His friends love to point out that the fluent French speaker has more qualifications than Boris. Of course, as the youngest of the Johnson clan, he had a great deal of catching up to do in the wake of Boris, now 48, journalist Rachel, 47, and entrepreneur Leo, 45. After three lucrative years as an investment banker with Deutsche Bank, he joined the Financial Times – working in Paris and South East Asia before editing the influential finance column, Lex (a previous incumbent being Nigel Lawson). He eventually turned to politics and was selected by the Tories to fight the seat of Orpington, which he won in 2010. His parliamentary career has been unremarkable, as he has risen from being an effective member of the Public Accounts Committee to junior whip. Diffident to the point of shy, the only things he appears to have in common with Boris are his genes and blonde hair. No showman, he’ll never appear on TV’s Have I Got News For You or get himself stuck on a zipwire. He’s sanguine about living in the shadow of his celebrity brother, who has 685,000 followers on Twitter to his own 3,500. Although Jo, like Boris, was a member of the notorious Bullingdon Club (a drinking society known for its wanton acts of drunken vandalism, and numbering Oxford’s wealthiest undergraduates among its members), he has strong links with the Left through his marriage. His wife is Amelia Gentleman, the Guardian’s trenchantly left-wing social affairs correspondent. Her father is the brilliant artist David Gentleman, best known for being the most prolific designer of stamps in the Post Office’s history and for his platform-length mural at the Charing Cross Tube station in London. Amelia (who went to St Paul’s, one of Britain’s leading private schools) and Jo have two children and a conventionally happy marriage that is the antidote to Boris’s scandal-strewn love life. As one of Cameron’s so-called ‘modernisers’, Jo will use his role in the No 10 policy unit to give the PM’s image a sharper political edge and develop radical ideas for a government widely thought to have run out of intellectual steam. Among his key interests are the benefits of Britain forging stronger economic and strategic links with India. Unlike Cameron, though, he believes that the Government should cancel its controversial £250million annual aid package to the country. Such views will clearly infuriate Nick Clegg and the Lib Dems, who believe that the policy unit should serve the interests of the Coalition rather than just the Conservative Party. Labour will undoubtedly try to exploit Jo Johnson’s links with Boris, as well as depicting him as utterly out of touch with the struggles and aspirations of ordinary voters. Only the eagle-eyed will have spotted Jo in embarrassing published photos of ‘The Buller’, wearing the members’ uniform of Georgian tailcoats. He is standing proudly in a group which includes a young George Osborne. Labour will surely also highlight the fact that Cameron’s revamped policy unit team includes two more Old Etonians: Hereford MP Jesse Norman, who is also the former director of an investment bank, and bungling Cabinet Office minister Oliver Letwin. For the non-partisan observer, however, the most intriguing tensions are not political but familial. The father of the Johnson clan, Stanley, is unrepentant about having created a competitive atmosphere among the four siblings and has described Boris as ‘the great prodigious tree in the rainforest, in the shade of which the smaller trees must either perish or struggle to find their own place in the sun’. With typical self-promotion, sister Rachel reacted to Jo’s appointment with a tweet, saying that she’s waiting for ‘her telephone call from 10 Downing Street’. For his part, an irritated Boris (who is now not an MP, remember) is already being ribbed that his ‘little brother’ got to Downing Street first. The risk for him is that Jo will become accustomed to being in No 10. Mr Cameron shocked Westminster last week by appointing 41-year-old Jo as head of his policy unit. The promotion prompted headlines about Jo becoming the ‘first Johnson into No 10’, with profile writers noting that although both men attended Eton and Oxford, only Jo – the more ‘sensible’ of the two – won a first-class degree. But according to a 1992 edition of the student newspaper Cherwell, Jo had more of a buccaneering image at the time. In a piece written to mark Jo’s appointment as editor of Isis, a rival publication, Cherwell described Jo as a ‘Nat-ite’, a reference to his friendship with banker Nat Rothschild: Jo was famously pictured with Rothschild and George Osborne in a 1993 Bullingdon Club photograph unearthed by The Mail on Sunday. The Cherwell article, written at the start of Jo’s second year as a Balliol history student, describes him as a ‘Rothschild crony’. It says: ‘His crowning glory was an article he penned for the Daily Torygraph over the summer about the New College Ball … a 100-word piece shuffled into the corner of the Peterborough column.’ According to Cherwell, Jo told the Telegraph that ‘class war loonies’ who had disrupted the rival ball were Balliol students, triggering a furious reaction. Stanley Johnson got the news late because he spilled wine on his phone. Now a proud father celebrates his son Jo’s new job in No10. A Johnson in No 10! I did a sudden double-take when I saw the front-page headlines. Jo had telephoned me a couple of days earlier to say that some kind of move was under discussion, but I certainly hadn’t been expecting front-page news. The BBC had the story too. My son’s appointment to head the Downing Street Policy Unit didn’t lead the news, but it was not far off. My mobile phone didn’t ring much that morning but that was only because I had spilt a glass of wine over it the night before. As the youngest of the Johnson clan, Jo had a great deal of catching up to do in the wake of Boris, now 48, journalist Rachel, 47, and entrepreneur Leo, 45. At 11am when I had finally got a substitute from the helpful O2 shop in Camden Town (thank you Nigel Izuchi from Nigeria! ), I had a stack of missed calls and voice mails. My first reaction was a purely personal one. I split up with my first wife, Charlotte – Jo’s mother – at the end of 1978 when he was seven. I have never sought to minimise the impact divorce has on a young family and I do not do so now. It would be absurd to pretend that young children do not feel a cataclysmic shock when their parents go their separate ways. As a father, one has obviously a sense of pride when a child shines in his or her chosen career. In the case of my children, I say to myself: ‘I jolly well did let them down. But they seem to have come through anyway, thank God.’ I particularly feel that in the case of Jo, the youngest of my first four children. Charlotte, a brilliant painter, had not been particularly well during Jo’s early years. I had perhaps done more ‘parenting’ in Jo’s case, than I had in the case of his older siblings Boris, Rachel and Leo. I can certainly remember quite often reading Jo to sleep in those early years in Brussels when I was working for the European Commission. (And I discovered the Fisher-Price tape-player. You could switch it on and leave it by the bed, while you answered the phone or poured yourself a drink!) When did Jo first begin to surprise me? When did I say to myself: ‘Wow, this kid has really got something’? I can remember the moment very clearly. It was in July 1994 when he had just finished his last year at Oxford. I was living in Oxford at the time but Jo had already left, so he asked me if I would go to look at the exam results which would be posted on a certain day. I duly looked at the list of third class degrees first. Jo’s name didn’t appear. ‘That’s a relief,’ I said to myself, ‘at least he’s got a second.’ I looked at the seconds. No Jo. ‘Oh dear!’ I said to myself, ‘has he got a fourth?’ When finally I discovered Jo’s name among the firsts, I have to admit I did an Osborne. Not a total Osborne. But a definite puckering-up. I never really knew Jo was seriously interested in politics until one night I got a text message saying he had been selected as the Conservative candidate for Orpington by one vote on the sixth ballot. And when, on Election night on May 6, 2010, the brilliant electors of Orpington tripled the Conservative majority to over 17,000, and Jo stepped forward on to the rostrum to thank them, I have to admit that I had another of those Osborne moments. I felt much the same this week when I saw those headlines. It may be a bit odd for a father to take to the pages of a Sunday newspaper to congratulate his son on a spectacular achievement but what the hell! I raise my glass. Jo may have started late in the political stakes, but he has certainly come on fast. Jo Johnson worked for the Financial Times – once the europhiles’ favourite paper and attended a school for the children of eurocrats. As one of Cameron’s so-called ‘modernisers’, Jo Johnson, will use his role in the No 10 policy unit to give the PM’s image a sharper political edge. The PM and Mr Johnson met today at Downing Street, but Jo’s appointment as the head of David Cameron’s policy unit took most people in Westminster by surprise. Over the last few days, some more fanciful commentators have been speculating about a possible Bo-jo v Jo-jo contest. Is that going to happen in some distant future? Frankly, I haven’t the faintest idea. But if it did, I am sure that – from a spectator point of view at least – it would be tremendous fun. We Johnsons, as I keep on reading nowadays, are ‘famously competitive’. In my view, Jo, as an MP head of the policy unit with ministerial rank, has a chance to contribute to the major regeneration of Conservative fortunes which could, I believe, now be in prospect. Yes, we will lose seats in next week’s local elections but that was always on the cards, given how well we did last time. More to the point is the fact the Conservatives, at this point in the electoral cycle, could be much further behind than they are. But what will it take to bring the party together into a coherent, unstoppable force between now and May 2015? The key thing will be actually to listen to the voice of the traditional Conservative voters. I spent almost 20 years on European issues. It’s time to lance the boil one way or another. Bill Cash’s call for a referendum now – that is, before the next Election – makes a lot of sense. At the very least there is surely a strong case for getting the legislation providing for a referendum through Parliament before the next Election. Jo may be a ‘European’. He grew up in Brussels, went to school there, and holds degrees from two European universities, as well as Oxford. But that doesn’t mean he’s a fanatic European. Jo, obtained a First from Oxford, is a fluent French speaker has more qualifications than Boris. I’ve canvassed with him in Orpington. I’ve spoken at the Orpington Ladies Lunch Club! It’s quite clear to me that traditional Conservative loyalists in Orpington and around the country are troubled, to put it mildly, at the current state of the relationships between Britain and Europe. Jo is astute enough to see that finally making good on David Cameron’s ‘cast-iron guarantee’ of a referendum is politically wise as well as intellectually coherent. There are other things the new policy team might want to take another long, hard look at. Have we really got immigration under control? How many Conservative voters does planning Minister Nick Boles lose each day in his mad rush to concrete over the green fields? Why do we need all those new houses, if not because the previous government simply let immigration run riot? Why, for that matter, do we need the HS2? Aren’t there other, far better things to spend £30 billion on … and counting? And, while I’m about it, what about the mad EU biofuel directive which is leading to the destruction of rain-forests all over the world? And Jo’s wife, Amelia Gentleman, is an award-winning reporter for The Guardian, so I doubt if she shares my opinion. But Jo has a cool head and a logical mind. He is trained to see beyond the breakfast table. Much has been made of the Conservatives’ need to ‘reconnect’ with their roots. That, as far as I can understand, is one of the things Jo will have to promote in his new role. Does this all sound pretty serious? Does it sound too serious? In politics, as in real life, a good sense of humour can go a long way. So is Jo going to be funny enough? If you have any doubts, just click on to YouTube and watch Jo’s maiden speech in the House of Commons on June 27, 2010, a few weeks after the General Election and the formation of the Coalition Government. Jo begins by saying: ‘Anyone hoping that I will enliven proceedings in the manner of one of my elder brothers is likely to be sadly disappointed.’ He goes on to read out a quote from Private Eye. ‘He could not be more different to Boris. It is as though the humour gene by-passed Jo altogether and he inherited only the ambition gene!’ I was in the chamber that day and I heard the loud laughs that greeted that remark. But Jo turned the joke into a serious point, saying: ‘It is absolutely fair comment, but I don’t really apologise for the humourectomy, nor indeed for any hint of ambition that you might detect. ‘For these are serious times and politicians need to be ambitious when the country is in such a mess. ‘History will not forgive us if we flannel around in this house for the next five years and fail to pick the economy up off the floor where it is at the present.’ Watch this space! At the Agricultural Show held annually in Peebles the Conservative Party, as usual pitch their tent. 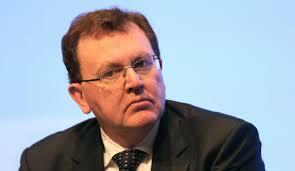 The only Tory MP in Scotland, David Mundell is the sole occupant, ever waiting, ever wanting to meet his constituents. Farmers and locals have pointedly given the tent the title “The Rare Breeds” category. What sort of politician is David Mundell? The personal and political background of David Mundell, the 47-year-old MP for Dumfriesshire, Clydesdale and Tweeddale, is not that of your average Conservative cabinet minister. Mundell joined the Young Conservatives aged 14 but defected to the Social Democratic Party (SDP) while studying law in 1981. “The first Thatcher government did get a bit bogged down and it wasn’t really the radical government that subsequently emerged,” he explained in 2002. “And the fact that you had a completely new opportunity to wipe the slate clean, with no baggage, was a very attractive thing”. He is a subtle and shrewd tactician. In 1984 he was elected Scotland’s youngest serving district councillor while forging a legal career with BT Scotland. Although he failed to shine as an MSP between 1999-2005, Mundell enjoyed the mercurial world of Westminster from 2005 and struck up a good rapport with David Cameron. Usefully, he also backed Cameron’s leadership bid before his game-changing 2005 conference speech. In the 2005 general election, he was elected as MP for the Dumfrieshire, Clydesdale and Tweedale constituency. He was the only Conservative MP representing a Scottish constituency. He resigned from the Scottish Parliament in June 2005 following his election to Westminster and being the sole Conservative representing a Scottish constituency he quickly gained public attention relative to other newly elected MPs. He was appointed by David Cameron to the Shadow Cabinet as Shadow Secretary of State for Scotland in December 2005. Mundell’s internal party critics say he is “not up to the job” of Scottish Secretary. But his better-than-expected performance during the election campaign helped consolidate his position, his campaigning abilities evidenced by his trend-busting increased majority. The new Scottish Secretary is an accredited mediator in Alternative Dispute Resolution, which could come in handy over the next few months. He is also known, for reasons not altogether clear, as “Fluffy”. Mundell served as the Shadow Scottish Secretary in the Conservative Party’s Shadow Cabinet in run-up to the 2010 general election. Following the election, the Conservative Party formed a coalition government with the Liberal Democrats. Due to the Liberal Democrats’ having the larger number of seats in Scotland, the post of Secretary of State for Scotland was given to the Liberal Democrat MP’s Danny Alexander and then Michael Moore. He was given the non-cabinet role of Parliamentary Under-Secretary of State for Scotland which is a post supporting the Secretary of State for Scotland. He has been married and divorced and has 2 sons Oliver & Lewis and a daughter Eve. Mundell joined 18 MPs who are either Scottish or represent Scottish constituencies in signing a Commons motion stating football “should not be any different from other competing sports and our young talent should be allowed to show their skills on the world stage” endorsing the idea of Team GB entering a British football team in the London 2012 Olympics. Football governing bodies in Scotland, Wales and Northern Ireland and the public oppose a Great Britain team, fearing it would stop them competing as individual nations in future tournaments. Tory David Mundell (MSP) was caught trying to claim thousands of pounds in expenses after taking out an extra home loan and charging the taxpayer. He received thousands of pounds each year from Holyrood’s accommodation allowance, which lets MSPs buy second homes in Edinburgh. But documents published under the Freedom of Information Act show he remortgaged the property – then applied for more taxpayers’ money. Cameron’s own party soon blew apart his claim that he would stop narrow English nationalism. Senior Tories insisted they had not dropped plans for “English votes for English MPs”. The Tories’ desire to exclude Scottish MPs from these votes has fuelled English nationalism and is a threat to the future of the UK. Labour have warned the policy would turn Scots MPs into second-class citizens at Westminster. Labour justice secretary Jack Straw said “David Cameron may claim to support the Union but his policies would destroy it. Cameron’s plan for English votes for English laws is dangerous and unworkable. March 9-2009: Crisis-hit Scots Tories called for their only MP’s head yesterday after he branded them clueless no-hopers. Former Tory MSP Brian Monteith said Mundell had to go. He said: “If he refuses to resign, he should be sacked.” Tory websites were flooded with calls for Mundell to quit after his memo was exposed. In the memo to Cameron last June, Dumfriesshire MP Mundell hit out at Scots Tory leader Annabel Goldie and her team. He complained of a “simple lack of thinkers” among the 17 Conservative MSPs. He claimed they had failed to embrace Cameron’s moderate approach, claiming they “don’t get it”. Mundell also said Goldie was being slated for her “lack of activity and strategic thought”. Cameron will address the Perth conference today in a bid to rescue the party’s Holyrood campaign. Yesterday, he said Goldie was doing a “great job”. A spokesman said there were no plans to discipline Mundell. Mundell, Scotland’s only Tory MP, backtracked over an embarrassing leaked memo which has overshadowed the party’s conference. In his first comments since the scathing assessment of his Holyrood colleagues was revealed, the MP for Dumfriesshire, Clydesdale and Tweeddale paid tribute to the party’s Scottish leader, Annabel Goldie, saying he had ‘every confidence’ in her. In the memo, he described her and her colleagues as ‘clueless’. In addition, he said Goldie was guilty of ‘a lack of activity and strategic thought’. He made no apology for the contents of the memo yesterday, but expressed regret that it had been leaked to the media. After a warm reception from delegates, Mundell said the memo was ‘a distraction’ from the main event. ‘We will not be able to continue to change as a party or make the electoral strides we want to if we cannot have a full and frank discussion within our party without fear that anything which is said will make its way into the media,’ he said. Earlier, he told BBC Scotland that he thought Goldie was ‘more than up for the job’, adding that he was confident she would bring back an increased number of MSPs in May. Goldie and party chairman Peter Duncan, whose replacement was called for in Mundell’s memo, sat side by side during the MP’s speech. They did not applaud during his opening comments, but did so later. Goldie received a standing ovation during her speech, in which she insisted the Tories were a united force. She repeated an earlier jibe, saying that at least Tory emails did not end up the subject of investigation at Scotland Yard and dismissed the leaked memo as ‘a little local difficulty’. Despite yesterday’s attempts to put a positive spin on the story, it has been deeply damaging to the party. According to some sources, there is now a major split between David Cameron and senior Scottish Tories over the leader’s refusal to take any action against his Shadow Scottish Secretary. Edinburgh University Students Association president candidate, Oliver Mundell has apologised for reducing a disabled NUS liberation officer to tears. “I understand that liberation is a sensitive issue but I have always tried to keep my own personal emotions out of decision making, putting the needs of students first. I’m really sorry if my point of view has been upsetting or misinterpreted but, I’d rather not engage in petty NUS politics. Mundell is adamant, however he has consistently argued that the token liberation that NUS offers is a distraction from the real issues that affect the very students these positions are designed to help.” Comment; His right wing leanings exposed early. Oliver Mundell’s father David has been Shadow Secretary of State for Scotland since 2005, and is the only Conservative MP to represent a Scottish constituency in the Westminster parliament. His son Oliver unsuccessfully campaigned for the post of President of the Student’s Union at Edinburgh University. When questioned about a future in politics he said “Although I don’t totally agree with his political views, I do think the Conservatives give people a clear set of beliefs and values. They’re just not necessarily the same as mine.” But he changed his tune after university when he took up a highly paid post working for his dad as a SPAD before moving to Westminster taking up a similar post with in the office of a Conservative MP representing South West Region. Public outrage had clearly reached the quiet village of Innerleithen, near Peebles, in Mundell’s constituency of Dumfriesshire, Clydesdale and Tweeddale, the kind of anger Labour MP Diane Abbot was talking about when she said voters wanted to see “dead MPs hanging from lamp-posts”. Earlier, Mundell faced more wrath as he knocked on doors in the Well’s Brae area of the village, where the Tories are fighting against the Liberals for votes. “It’s disgraceful,” said the male occupant of one house, with very little prompting. “I think it’s important to find out what people are thinking,” Mundell said. He soon found out. “In Innerleithen, I would imagine that 60 per cent of the population are all below the national minimum wage,” Mundell’s constituent said. “I’m disgusted with what’s happening at Westminster and I’m not sure if I’m going to vote in the local election.” Mundell persisted “David Cameron is trying to sort it out…” But his words had little effect. “Poor working people aren’t able to claim money like that,” the man said. “Not many people around here have moats,” he added before closing the door. Norman Donald, a Conservative supporter, and his wife Sally were prepared to overlook the damaged reputation of politicians and invited Mundell into their house. “It is absolutely shocking,” Donald said. “I work in the knitwear trade in Hawick and I have just accepted a 10 per cent pay cut – again. So this is a very hard pill to swallow.” As the anger mounted, Mundell admitted: “Clearly, you shouldn’t claim for clearing a moat. You can’t justify that.” “We haven’t got a moat,” said Sally Donald. “We’ve only got a fish pond.” “And I clean that myself,” added her husband. May 30-2009: Mundell, claimed over £3,000 on MPs’ expenses for cameras, photographers and photo-editing computer software to take hundreds of pictures of himself. The “Out and About” section of his website displays more than 700 pictures, mostly of Mundell in various different parts of his Dumfriesshire, Clydesdale & Tweeddale constituency. Mundell appears to have set himself the task of visiting as many places in his constituency as he can and getting his picture taken beside the road sign as proof. His tour has so far taken him to Bankend, Beattock, Boreland, Cardrona, Clarencefield, Durisdeermill, Ecclefechan, Gretna and Hightae, to name but a few. He is also pictured taking overseas trips overseas to places such as Israel and Rwanda. His passion for photography got him into trouble in August 2006, according to details contained in his expense claims. A picture of “David Mundell and Family at Biggar Bonfire” was used on the MP’s website and in a parliamentary report, without authorisation from the photographer. As a result, Mr Mundell was sent an invoice for £175 for its use on the website with another £175 added on top as a penalty for failing to seek his permission. The picture is no longer included among the hundreds on his website, but there are numerous others such as “David with brick on head” from an August 2007 trip to Rwanda, two pictures of the MP at the “Crowning of Anna’s Queen of the Border” – but none of the queen, one of him pulling a pint behind the Strangers’ Bar in Parliament; and another showing Mr Mundell in a colourful costume to promote the “Be Loud” bowel cancer campaign in January last year. It is possible that some of these will have been taken with one of two Olympus cameras bought from John Lewis for a total of £528 in May 2006. In April last year Mr Mundell bought a copy of Adobe Photoshop, a computer programme used to edit digital photographs, for £468. Most pictures on Mundell’s website appear to be the work of an amateur, but he does also employ professional photographers and claims back their fees on expenses. In March 2006, he hired one to photograph a school visit to the Palace of Westminister at a cost of £117.50. The same photographer was on hand in October 2007 to capture the Scottish Agricultural College’s visit to the House of Commons for £99.87. In Scotland, another professional photographer was paid £140 in October 2007 “to photograph David around Peebles and Lead Burn Junction”. Another captured him “meeting road contractors” in Canonbie, and at Langholm for a “Save Eskdale” event in August of that year, for fees totalling £220. Mundell said “Over four years, the cost of photographs and equipment work out at about £65 per month and I am happy for the Conservative independent scrutiny panel to review whether that is excessive. I use photographs on the website. I send photographs to the 12 local newspapers in my constituency and I also use photographs for Parliamentary publications. Mr Mundell said he had already repaid a sum to cover the cost of beer, a Gingerbread Santa and a Gingerbread Rudolph which appear on receipts to back up claims made on his IEP. Mundell said he was uncertain whether they had been part of a claim or included on receipts for other items which were being claimed for. “But I recognised the potential for ambiguity when I went through my receipts myself as part of the redacting exercise,” he said. He claimed there were good reasons for his low activity levels in parliament. “As a member of the Shadow Cabinet, I am obliged to follow Conservative party policy for Scottish MPs and not vote on English-only matters. This has a considerable impact on my simple percentage voting record. As the frontbencher who has responsibility for Scotland, I am restricted by the Commons rules on the issues on which I can intervene in general debate.” He added that he was the only Scottish Conservative MP and also Shadow Secretary of State with “a broad range of responsibilities and duties on which I am required to be in Scotland”. I feel sick to the stomach that an MP from the party I support could even contemplate claiming money for a wreath, let alone actually going ahead and doing it.” So bad news for the Tory Shadow Scottish Secretary David Mundell, who claims for wreaths. Pretty much unashamed that his tribute to those who made the ultimate sacrifice is to put in an expense claim. 22 October 2009: A Young, ambitious politician finally won a seat in Parliament. He squeezed into his berth on the green leather benches and gazed excitedly at the sullen faces across the chamber. 29 October 2009: Senior Conservatives asked David Cameron to drop Mundell from a future Tory cabinet Fearing he would be no match for Alex Salmond. July 25-2010: David Mundell, Scotland’s only Conservative MP, stands accused of orchestrating a muck-raking campaign against his Liberal Democrat boss. Former Tory Party Westminster candidate, well respected, hotelier Chris Walker alleged that Mundell gave him a copy of Moore’s claims and told him to “dig up as much dirt” as he could from the parliamentary expenses claimed by Scottish Secretary, Lib/Dem Michael Moore. At interview Walker said “It sickened me to the pit of my stomach, I thought, this isn’t what politics is about.” (He later withdrew from the fight for the Berwickshire, Roxburgh and Selkirk constituency) and left the Tory Party. Mundell dismissed Walker’s claim as “spurious” and denied any wrong-doing. However, it did lead to friction at the Scotland Office, where Mundell was Moore’s deputy. August 15-2010: David Mundell, Scotland’s only Conservative MP, is heading for court after the Sunday Herald exposed a potential criminal error in his General Election spending. The Scotland Office Minister, who is in charge of election conduct north of the Border, is preparing to petition the Court of Session after filing a misleading account of how much he spent on the campaign trail earlier this year. Mundell, 48, is expected to ask permission to make retrospective changes to his official spending returns, which he previously signed off as “complete and accurate”. However, even if successful, he still faces a legal sanction for breaking the spending limit on the last leg of his campaign – a mistake he admitted to only after exposure by the press. A political war of words broke out yesterday after Mundell accused Labour and the SNP of being reactionary parties determined to prevent reform in Scotland. He told delegates at the Tory Party conference that Labour and the SNP were not interested in “Scottish solutions for Scottish problems and said that ideas which could improve heath and education were ignored because the “little book of Scottish Labour mythology” had spread “irrational fears” about the Tories. Labour and the SNP hit back accusing Mundell of insulting Scots. Labour claimed the problem for many voters was that the legacy of the last Conservative government was “no myth”. Mundell said “it’s ‘time we got tough with the big six energy companies” and this just weeks after his Government refused Dumfries and Galloway MP Russell Brown’s calls to bring in the Competition Commission to “break the stranglehold” that the big six energy companies have on the market and for tough action to bring down bills. Mundell made the remarks ahead of a visit to the Far East by Scotland’s Finance Secretary John Swinney which is aimed at promoting trade. He further stated that Scottish ministers would lose the possibility of meeting their counterparts in foreign visits if Scotland ever became independent from Britain as it was Westminster that opened doors for Scotland. He then offered that David Cameron had just been to Japan and the idea that John Swinney would make a greater impact than the Prime Minister was preposterous. 14 May 2012: Extreme right winger Mundell is a founder friend of the “Cornerstone Group” a forum for MPs who wish to defend traditional British values – faith, flag and family. Tory minister Mundell was last night accused of “running scared” after swerving a confrontation with victims of the bedroom tax. The Under-Secretary of State for Scotland had been due to meet Renfrewshire Council leader Mark Macmillan to discuss the controversial under occupancy legislation. But he called it off at the last minute on Monday afternoon, just as Work and Pensions Secretary Iain Duncan Smith was getting a public mauling over other cuts. And pressure group Bin The Bedroom Tax Renfrewshire, who had been planning a protest outside the meeting in Renfrew yesterday, claim he called off because he was afraid to tackle the issue head-on. Mundell was ranked among the worst performers in an analysis of MPs’ value for money. He came in 587th place for 2007/08 based on his contribution in parliament. His attendance/speaking record in the Commons shows he attended only 47 per cent of votes, spoke in only 11 debates and submitted just 16 written questions in the year, much less than the overall average. Conversely his expense claims were in the top ten of over 600 MP’s. Mundell (Conservative): “Of course the hon. Lady does not acknowledge the 1,000% rise in the use of food banks under the last Labour Government. We want to look at, and understand, why there has been an increase in the use of food banks. That is why the Department for Environment, Food and Rural Affairs has committed to an extensive study on the use of food aid across the United Kingdom, and she will be able to read that when it is published.” Comment: Labour, Tory and Lib/Dem parties are jointly complicit abusing the people of Scotland whom they are sworn to protect. 14 January 2014: Mundell accused of “bare-faced gall” over his claims the Scottish Parliament had sufficient powers to scrap the so-called ‘bedroom tax’. Conservative MSP Alex Johnstone asked for “a commitment that these policies will be fully costed prior to the referendum in September”. The Minister replied “all the policies of this Scottish government are fully costed. I don’t think we’ll take any lessons from the Tories on budgets or costing”. 28 Apri 2014: Mundell creates mischief misquoting Alex Salmond about Scotlands fishery policy post referendum. Mundell was facing the MSPs after Scottish Secretary Alistair Carmichael pulled out. Committee member Annabelle Ewing went on to say “It is very disappointing that Alistair Carmichael did not attend the Welfare Reform Committee today. While everyone understands the importance of the commemoration on World War 1, Alistair Carmichael has a duty to appear before the Scottish Parliament and explain why the UK welfare system is ‘fantastic’ as he has previously claimed, and it would be good if it could be rescheduled.” Comment: Why the hell is he smiling? Appalling belated admission by Mundell. Only 6 months from the general election clearly putting a bit of distance between himself and Westminster. Badly needed if he is to survive. As for Carmichael he couldn’t even be bothered to turn up, disgraceful but par for the course where he is concerned. August 30-2014: At Westminster, Mundell expressed his great pride at being invited to open a food-bank in Peebles. 18 August 2014; Mundell issues fraudulent election campaign literature only just a month before the country goes to the polls. A page-long “better together” promotion sent out to all of his constituents purporting to air the views of a constituency family backing the campaign message for the forthcoming Independence Referendum has caused anger. The profile piece entitled ‘Putting family first – why we’re voting No’ features Keith and Michelle. But nowhere in the article does it reveal the couple’s surname or that Keith is an elected Conservative councillor for Tweeddale West. Local music tutor Sarah Northcott from Tweedsmuir said “I received Mundell’s campaign leaflet and it contains a section where a family explains why they will be voting “No” , “I thought they looked familiar – the family portrayed is that of local Tory councillor Keith Cockburn, but nowhere is it mentioned in the leaflet that he is a local politician. This is, at best, highly misleading – could they not find a local family without Tory party ties to speak against independence?” Councillor Cockburn, a local businessman, won the Tweeddale West by-election last year. November 10-2014: Mundell betrays his promise to meet food bank providers. Mundell told the Welfare Reform Committee he would meet with representatives from food banks. Mundell has been branded devious and disrespectful by voters. Constituent John Hodgman says he thought Mundell was standing for the SNP after reading the leaflet which was delivered last week. Pensioner John said: “The words Conservative or Tory don’t appear in his campaign leaflet at all. There is no reference to Mundell being a member of the Westminster government and not a single line about its record nor policies.” John, from Moniaive in Mundell’s Dumfriesshire, Clydesdale and Tweeddale seat, said “The leaflet is devious and disrespectful. David Cameron is preparing to offer the Scottish Parliament powers in excess of of The Vow proposals agreed by the Smith Commission. New Tory Scottish Secretary David Mundell has signalled that the Prime Minister is open to delivering full tax and spending powers to Holyrood. Speaking in Downing Street after being appointed yesterday, Mundell – the sole Scottish Tory MP – said the all-party commission’s proposals for further devolution would be up for negotiation. Echoing Nicola Sturgeon’s words after Scotland returned 56 SNP MPs, he added: “I can give the absolute guarantee it will not be business as usual. Scottish Secretary David Mundell was yesterday condemned for having a “contemptible” attitude to child poverty after claiming welfare cuts would have no effect on children. He said there was “no evidence” there would be an increase in the number of children falling into poverty as a result of £12billion of welfare savings due in the next few years. Labour MP Ian Murray said Mundell’s approach to the issue was “contemptible”. During the first Scottish Questions of the new Parliament Mundell told MPs that there had been a “relative decrease” in child poverty in Scotland. Scottish Secretary David Mundell wrote on his personal website that it was time to “acknowledge in public as well as in private, who I am”. The 53-year-old MP said he hoped that coming out would not change anything about how he was treated. He is believed to be the first openly-gay Conservative cabinet secretary. His announcement brings the number of openly-gay MPs in the House of Commons to 33 – the highest proportion of any parliament in the world, according to a study by US academics – and means there are as many on the Tory as the Labour benches. a. He is the son of Hungarian immigrants whose original surname was Hircsák who fled their home during the Hungarian Revolution of 1956. They came to Britain, initially claiming asylum, and anglicised their name to Hilton. He won a scholarship to Christ’s Hospital School in Horsham before reading Philosophy, Politics, and Economics at New College, Oxford. b. Hilton is married to Rachel Whetstone, a former aide (political secretary) to Michael Howard, who is now head of communications at Google. They live in the San Francisco Bay Area with their two sons, Ben and Sonny. The couple were godparents to David Cameron’s son Ivan, who died at age six. c. After graduating from Oxford University with a degree in Philosophy, Politics and Economics, Hilton joined Conservative Central Office, as a researcher, where he came to know David Cameron and Rachel Whetstone, his future wife and Global VP of Public Affairs and Communications for Google. d. He liaised with the party’s advertising firm, Saatchi and Saatchi, and was praised by Maurice Saatchi, who remarked, “No one reminds me as much of me when young as Steve.” During this time Hilton came up with the “New Labour, New Danger” demon eyes poster campaign for the Conservative’s pre-general election campaign in 1996, which won an award from the advertising industry’s Campaign magazine at the beginning of 1997.
e. Hilton went on to work for international advertising agencies Saatchi & Saatchi and M&C Saatchi, during which time he led campaigns for clients in the private and non-profit sectors, as well as numerous political campaigns around the world – including for President Boris Yeltsin in Russia’s first free elections. f. Hilton started his own company, “Good Business”, a corporate responsibility consulting firm advising international and UK clients on ways to improve their impact on society. With his business partner Giles Gibbons, Steve also set up an award-winning London restaurant, The Good Cook, which aimed to showcase the ‘Good Business’ philosophy. g. During this period, Steve spoke and broadcast internationally as an advocate of corporate responsibility, and wrote a book, Good Business – Your World Needs You, which set out the case for businesses to play a more direct and active role in advancing social progress. h. Before the British General Election in 2010, Steve served as chief strategist for David Cameron throughout his five years as leader of the opposition and in his party leadership campaign. He is widely credited with developing the ideas associated with the modernisation of the British Conservative Party. i. His responsibilities, in government focused on the development and implementation of domestic policy, with a particular emphasis on: the promotion of enterprise and economic growth; public service reform; family policy; decentralisation, and government transparency and accountability. j. It has been reported that Hilton’s ‘blue sky thinking’ caused conflict within the civil service in Whitehall and according to The Economist, despite guiding the Party to electoral success Hilton “remains appallingly understood”. k. Steve is co-founder and CEO of Crowdpac.com, a new Silicon Valley technology start-up that will make it easier for people to find and support political candidates that match their passions and beliefs. He is also a visiting professor at Stanford University, teaching classes on innovation in government, and new solutions to poverty in America. 2.January 2010; The campaign to discredit Steve Hilton, Cameron’s favourite moderniser? a. Somebody has it in for Steve Hilton, the advertising wizard who packaged and marketed David Cameron. Somebody – almost certainly a colleague in the Conservative party – is intent on keeping him out of the team of advisers whom David Cameron is expected to take into Downing Street. The evidence of a conspiracy is the stream of revelations calculated to embarrass him at a critical moment in the political cycle. The main ones could only have come from Conservatives who think Mr Hilton has too much influence for the party’s good. c. Mr Hilton was the brains behind the poster campaign launched across the country on Monday, with a giant picture of Mr Cameron alongside the slogan: “We can’t go on like this. I’ll cut the deficit, not the NHS.” It was an invitation to vote for Mr Cameron and forget his party. That pronoun, “I” cut the shadow Chancellor George Osborne out of the picture, along with everyone else, and was sure to create wounded feelings. To add to the doubts, the Daily Mirror, which tailed Mr Hilton for two days to obtain pictures of him jumping red lights on his bike, also came up with evidence that Mr Cameron’s picture had been touched up to give him more hair and pouting lips. Questioned about this on the Today programme, Mr Cameron replied tetchily: “Look, I don’t produce the picture or the poster” – not very encouraging for the person who did. d. Then there was the sudden, late appearance of a story that is actually more than a year old. On 1 October 2008, at the end of the Conservative conference in Birmingham, Mr Hilton had an altercation with a member of staff at New Street station as he was hurrying for a train and could not lay hands on his ticket. Allegedly, he called the official a “wanker”. He was arrested, but later de-arrested and served with a £80 penalty notice for disorder. It is not the fine that will have hurt Mr Hilton, but the humiliation of having the story all over the media in the very week when electioneering began in earnest. e. Mr Hilton is not a politician but an advertising man who was a rising star at Saatchi & Saatchi, and who voted Green in 2001. The most familiar image of him is as the prototype for Stewart Pearson, the fictional, bald, casually dressed Tory spin doctor in Armando Iannucci’s The Thick of It, who regales staff with buzz phrases like, “knowledge is porridge”. f. Friends say Mr Hilton, the son of a Hungarian immigrant who changed his name from Hircksac, is nothing like his fictional counterpart, yet he cycles to work in shorts, never wears a suit, is almost bald, and uses phrases such as “harnessing the insights of behavioural economics and social psychology can help you achieve your policy goals in a more effective and light touch way”. g. He has more influence over David Cameron than most, if not all, MPs. His wife, Rachel Whetstone, was an adviser to Michael Howard before she became head of communications for Google. They recently bought a £1,050,000 house in Oxfordshire, seven miles from the Camerons’. i. He is the guru who persuaded David Cameron to cycle to work, be seen without a tie, to be photographed in the Arctic, and come over as a policy-light, eco-friendly Tony Blair lookalike. This makes him anathema to Conservatives who want less image and more policy, less modernity and more banging of the traditional Tory drums. b. We go into the general election on 6 May 2010 with trust in politics and politicians at an all-time low. And I can understand why: the years of broken promises, the expenses scandal, the feeling that politicians have become too remote from the people – they’ve all taken their toll. That’s why I’m making this contract with you. c. For too long, you’ve been lied to by politicians saying they can sort out all your problems. But it doesn’t work like that. Real change is not just about what the government does. Real change only comes when we understand that we are all in this together; that we all have a responsibility to help make our country better. This contract sets out my side of the bargain: the things I want to do to change Britain. c. But it also makes clear that I cannot do it on my own. We will only get our economy moving, mend our broken society and reform our rotten political system if we all get involved, take responsibility, and work together. So this is our contract with you. I want you to read it and – if we win the election – use it to hold us to account. If we don’t deliver our side of the bargain, vote us out in five years’ time. i. Give you the right to sack your MP, so you don’t have to wait for an election to get rid of politicians who are guilty of misconduct. ii. Cut the number of MPs by ten per cent, and cut the subsidies and perks for politicians. iii. Cut ministers’ pay by five per cent, and freeze it for five years. iv. Give local communities the power to take charge of the local planning system and vote on excessive council tax rises. v. Make government transparent, publishing every item of government spending over £25,000, all government contracts, and all local council spending over £500. i. Cut wasteful government spending so we can stop Labour’s jobs tax, which would kill the recovery. ii. Act now on the national debt, so we can keep mortgage rates lower for longer. iii. Reduce emissions and build a greener economy, with thousands of new jobs in green industries and advanced manufacturing. iv. Get Britain working by giving unemployed people support to get work, creating 400,000 new apprenticeships and training places over two years, and cutting benefits for those who refuse work. v. Control immigration, reducing it to the levels of the 1990s – meaning tens of thousands a year, instead of the hundreds of thousands a year under Labour. i. Increase spending on health every year, while cutting waste in the NHS, so that more goes to nurses and doctors on the frontline, and make sure you get access to the cancer drugs you need. ii. Support families, by giving married couples and civil partners a tax break, giving more people the right to request flexible working and helping young families with extra Sure Start health visitors. iii. Raise standards in schools, by giving teachers the power to restore discipline and by giving parents, charities and voluntary groups the power to start new smaller schools. iv. Increase the basic state pension, by relinking it to earnings, and protect the winter fuel allowance, free TV licences, free bus travel and other key benefits for older people. v.Fight back against crime, cut paperwork to get police officers on the street, and make sure criminals serve the sentence given to them in court. vi. Create National Citizen Service for every 16 year old, to help bring the country together. c. The leaking of Hilton’s thoughts to the FT appeared to owe more to the investigative powers of the newspaper rather than to an operation by a particular faction in government. but the fact that a series of Whitehall figures felt free to speak in dismissive terms to the FT about Hilton’s ideas show that he has detractors at the heart of the government. A number of Lib Dems around Nick Clegg regard Hilton as a refreshing but somewhat wacky thinker. Furthermore, some figures in the Treasury believe that Hilton’s loose thinking was partly to blame for George Osborne’s failure to create a coherent and compelling message for the Tories’ election campaign. d. There was much mirth among these groups when the FT reported that Hilton had suggested that maternity rights and all consumer rights legislation should be abolished to help revive the economy. Hilton even suggested that Britain should ignore EU labour rules on temporary workers, much to the annoyance of the No 10 permanent secretary, Jeremy Heywood. “Steve asked why the PM had to obey the law,” one Whitehall source told the FT of a meeting in March to discuss the government’s growth strategy. “Jeremy had to explain that if David Cameron breaks European Law he could be put in prison.” (new to me this one since the French, German’s etc pick and choose which laws they will accept or ignore as it suits their agenda). e. Hilton also suggested that Whitehall could do its bit to cut the fiscal deficit by abolishing hundreds of central government press officers and replacing them with a single person in each department who would blog. He also said that Job centres should be closed and replaced instead by community groups. (Sir Jeremy Heywood alerted, warning lights switched on within the Civil service, enemy action counter action necessary). g. Hilton has been a central figure as No 10 and 11 have struggled since the autumn of 2010 to develop a coherent strategy for growth. There were reports earlier this week that Downing Street’s two neighbours and their aides were at odds over the government’s core economic strategy – the elimination of the structural deficit over the course of this parliament. This was wrong. But there have been tense discussions dating back to the spending review last autumn over how to stimulate growth. a. Downing Street have just announced that “Steve Hilton will be taking an unpaid academic sabbatical at Stanford University, starting this summer and returning next summer. With his wife and young family, Steve will be moving to California. He will join Stanford as a visiting scholar at the university’s Freeman Spogli Institute for International Studies (FSI), and will also be a visiting fellow at Stanford’s Hoover Institution. He will spend his year on campus teaching, researching and writing, and will focus on innovation in government, public services and communities around the world”. b. Downing Street won’t be the same when you head off to California. Gone will be the man who greeted President Obama in his socks and who walked the corridors of power in shorts and a T-shirt. Gone will be the person prepared not just to think the unthinkable but to challenge officials and ministers to explain why it couldn’t or shouldn’t be done – like scrapping maternity rights to make it cheaper for businesses to hire new workers, building a new airport on an island to the east of London or going to war with the EU to escape its bureaucratic rules. Gone will be the friend who calls the prime minister “Dave” and is willing to challenge him for not being clear enough nor impatient enough about how he wants to change the country. c. When they get home Sir Jeremy Heywood, George Osborne, Danny Alexander et.al. will secretly raise a glass and hope that yours is a one-way ticket to the United States and not just a year’s sabbatical. They will tell their friends and families that you were not an easy man to get along with. They will whisper that they’ve heard that you were the man who told the Times that the health secretary should be “taken out and shot” for his failure to sell the NHS reforms. Your departure, will further increase the power of two men in this government – the Cabinet Secretary, Sir Jeremy Heywood and the Chancellor, party strategist and Dave’s other best political friend, George Osborne. a. On 2 March 2012, Downing Street announced that Hilton would be a “visiting scholar” at Stanford University’s Freeman Spogli Institute for International Studies for a year. His departure will leave a strategic hole in the heart of Downing Street but Hilton – who has a young family – is taking a sabbatical because his wife, who is a senior executive at Google, needs to be close to the company’s California headquarters. Hilton will take up a teaching job at Stanford University, focusing on innovation in government, and has promised to return to London in 2013 ahead of the run-in to the 2015 general election. b. In a bid to show that his fundamental instincts have not changed Cameron will use a speech to party activists in London to say his vision of compassionate Conservatism, which Hilton helped develop, has not been dulled. But Hilton’s departure represents a blow to Cameron as he struggles to define his politics in the face of austerity, problems over the health bill and the more personal threat posed by his links to News International. Hilton’s skill has been to draw Cameron, instinctively a traditional Conservative, into a more unpredictable and modern figure. c. Hilton himself believes he is leaving at the right time with the bulk of the party’s 2010 manifesto agenda gradually taking legislative shape. But he has been pondering his departure for many months, expressing frustration at the slowness of the government machine. A natural insurgent, he feels at times he has been banging his head against a benign brick wall of civil service complacency. His often impatient style lost him friends in the civil service, leading to hostile briefings suggesting his ideas were impractical. He himself became frustrated at the pace at which the civil service moves, the apparent deference to EU regulations and the feeling that the levers in Numbers 10 do not work. His last memo advocated severe cuts in the number of civil servants in the United Kingdom and further welfare cuts. d. Although there was no great rupture, there was also a gradual disillusionment that Cameron in office has not proved as radical or risk-taking as he hoped. That sense of impatience led some to question whether Hilton return from California, especially since he finds the West Coast’s cultural distaste for rules matches his own attitude, dress sense and ability to make friends across political divides. He has taken leave before, in opposition, when he took six months off again to join his wife in California, spending much of the time on the phone to London to advise the Cameron election campaign, something that will be difficult to do in a rules-based government environment. Number 10 said he would not be replaced. e. Modernisers such as Hilton feel they are still in the ascendancy inside Number 10 and the cabinet office, whilst the leading conservative think tanks such as Policy Exchange share Hilton’s instincts. But the pressure will now be on backroom figures such as Rohan Silva, in effect Hilton’s deputy and advocate of transparency government, his speech writer Julian Glover and the polling adviser Andrew Cooper, to keep the flame alive. There has been talk of Silva quitting as well. f. Gaby Bertin, the press secretary, will also grow in influence, as will the cabinet secretary Sir Jeremy Heywood. The pressure on the public finances has already seen some of Hilton’s agenda pushed aside. His departure in particular will be seen as the final nail in the coffin of ‘big society’, an idea that Cameron and Hilton put at the centre of his opposition politics but that has disappointed in government. Similarly, the Treasury has been putting a remorseless pressure on the green agenda favoured by Hilton, a man who once voted Green. g. His wife has been travelling California once a week every month, putting pressure on the family. In the formal announcement Number 10 said:” Steve Hilton will be taking an unpaid academic sabbatical at Stanford University, starting this summer and returning next summer. “With his wife and young family, Steve will be moving to California. He will join Stanford as a visiting scholar at the university’s Freeman Spogli Institute for International Studies (FSI), and will also be a visiting fellow at Stanford’s Hoover Institution. a. Steve Hilton’s decision to leave Downing Street and decamp to California’s Silicon Valley with his wife and young son says a lot about politics, some of which is deeply traditional and a lot of which is peculiar to the times in which David Cameron’s closest source of strategic wisdom – to Star Wars fans his Yoda – cut his teeth as a workaholic practitioner in an addictive trade. Politics has always been a rough old business in which reputations can be made or destroyed by unforeseen events, bad judgment and worse luck. No one could have predicted a sitting prime minister being linked to an elderly police mount loaned to a scandal-laden tabloid apparatchik, as happened to Cameron in “Horsegate” this week. Hilton could be forgiven for banging his head on a desk. b. Yet it is par for the course once any government’s ever-briefer honeymoon with the voters – and events – is over. Unseen civil servants who run Whitehall’s private offices, as well as party appointees giving political advice such as Hilton, work gruelling hours, are there to shout and be shouted at when things go wrong, to share the adrenalin rush when their plans work. The pace wrecks nerves and livers, family life and marriages – and has long done so. Sheer physical stamina keeps the addicts afloat but most burn out sooner or later and need quieter jobs in which to recover. But nowadays the changing nature of communications technology makes the pressure that much greater, there is so much more that informed people are supposed to know from all quarters. It is the same for many professions, but government is conducted in the spotlight and nowadays that spotlight is never switched off by 24/7 TV, by the internet, Twitter and the rest. c. Hilton, 42 last August, is deeply enmeshed in this world. His parents were refugees from the Soviet tanks which crushed the Hungarian revolt in 1956 (it is, alas, not true that the Hirckacs adopted the name Hilton because they spent their first British night in one). Hilton went on a scholarship to Christ’s Hospital school in Sussex and did the inevitable PPE degree at Oxford, as Cameron and much of today’s political class also did. The pair met in John Major’s HQ campaign team in 1992, bright young men with an eye to the main chance, who shared some of the credit when Major came from behind to beat Labour and seed the fateful myth that “It was the Sun Wot Won It”. Cameron became a Whitehall special adviser – alongside Hilton’s future wife, Rachel Whetstone – while Hilton set up his own Good Business consultancy, advising firms (Coke and McDonalds were among his clients) on corporate social responsibility. That alone must have marked his card among free market Tories, that and the refusal not only to wear a suit and tie, but often socks and trousers. Biker Hilton still prefers T-shirts and shorts, a suit remains the big occasion option. Many on the right argue that a firm’s social responsibility is to make profits, create jobs and pay taxes – leaving social goals to government. d. When the Tories were defeated in the 1997 campaign by Tony Blair (Hilton shares some blame for the misjudged “demon eyes” poster) Hilton recoiled from William Hague’s doomed lurch to the right (and is rumoured to have voted Green). When Cameron succeeded Michael Howard in 2005 he saw that such “no such thing as society” talk had critically tarnished the Tory brand and that dramatic symbolic gestures of reform – hugging hoodies and huskies, learning to love the NHS, choosing HS1 over that third Heathrow runway – were need to “detox” the brand. Turning Etonian “Tory Boy” Cameron into middle class Dave was also a priority. The concept of the “big society” in which the state shrunk and private or voluntary groups grew to fill gaps is also laid at Hilton’s door as an over-arching election theme which few voters understood. With a recession under way it came to look like a posh word for cuts. e. In any case such marketing language appalled traditional Tories who believe that softie Hiltonian policies simply drove disaffected voters into the arms of UKIP or their own armchairs and help explain why Cameron failed to win an overall majority and was forced into a coalition with the hated Lib Dems. The bad feeling lingers on in disputes over NHS reform, welfare, the AV referendum which Cameron conceded (but also squashed) and Lords reform. That underrates Hilton’s successes, which include the promise of a referendum on the Lisbon treaty and putting fashionable theories – Richard Thaler’s “nudge” is one – into a practical context. But he clashed with Andy Coulson, Cameron’s ill-chosen hotline to Essex voters and thus a counter-weight to the brainy immigrants’ son, also with civil servants and colleagues who resented his influence, his restless energy, so much greater than most, and his lack of the silkier diplomatic skills. a. Steve Hilton, David Cameron’s chief strategy adviser, has left Downing Street, calling for £25bn welfare cuts and claiming an inefficient Whitehall machine could be massively reduced in size, possibly more than halved. The prime minister’s closest adviser for more than five years is taking a year-long sabbatical in California where he plans to study how governance can be improved. Hilton has had a series of run-ins within Whitehall, frustrated at the slow pace of reform and impatient for more radical thinking, including from Cameron himself. b. The Daily Telegraph reports that he has submitted a policy paper marking out a second phase of welfare reform that builds on the changes implemented by the work and pensions secretary, Iain Duncan Smith. Hilton claims another £25bn can be cut on top of the £18bn identified through the 2010 spending review process. The chancellor, George Osborne, has already signalled that he believes another £10bn of welfare cuts will be necessary by 2016 if extra cuts are not to be demanded from other government departments. c. Universal credit, the major reform being introduced by the government, has yet to be implemented, and there are nerves across Whitehall about how well it will work in practice. It is due to be implemented for new claimants from October 2013 with the transition completed in 2017. It is expected 500,000 people on current trends will be on universal credit by April 2014. The Telegraph sources claimed universal credit needed changing so there were clearer incentives for individuals to work longer hours. d. It is not entirely clear what this proposal means in practice since universal credit has already been structured so that an individual receives more the longer they work. One of the reforms being examined is how housing benefit can be reformed so that young people are required to live with their parents if they have no work. In public, at a lecture to the Policy Exchange think tank last week, Duncan Smith refused to be drawn about the need for further welfare cuts, but he is not temperamentally opposed to fresh reforms and has already outlined plans to reform disability living allowance. At the same time he has said there are no easy targets. e. Ministers have however been struck by the speed with which some people are disappearing from the welfare rolls as they are being brought in for work capability assessments by officials from the Department of Work and Pensions (DWP). The DWP announced this week that of the first 47,400 incapacity benefit claimants to be reassessed and found fit to work, 27% – 12,900 – had been on the benefit for more than 10 years. Eight per cent – 3,900 – had been on the benefit for more than 15 years. a. Steve Hilton’s parting shot as he left No 10, was to call for a slimmed down – some might say, an emaciated – civil service, and further welfare cuts. Mr Hilton was a long-standing adviser to the prime minister, at David Cameron’s side (apart from a brief spell in the States) in opposition and in government. But his latest advice has not been readily embraced by Mr Cameron’s Lib Dem partners in coalition. Chief Secretary to the Treasury Danny Alexander delivered a withering response at a lunch for political journalists on Thursday. b. With Mr Hilton in mind, he said most people don’t fire off memos when they leave an employer, adding “on their last day, they usually bring in a cake”. Further indicating that Mr Hilton’s views were sticking in the throat a little, Mr Alexander talked about his own “talented and committed” civil servants in the Treasury. And for his audience’s consumption over lunch, he made it clear that no decisions had been taken on any further reductions in the welfare budget. Sources at the Department of Work and Pensions are sceptical about the capacity to make further deep cuts. For good measure, Lib Dem sources say they have also seen off Steve Hilton’s plans to make it easier for private sector employers to “hire and fire” workers. c. But in the next few weeks, when a civil service White Paper is published, the coalition as a whole will have to decide how radical their reforms to the “Rolls Royce” service should be. Can it run more efficiently on less fuel, or does it need a more drastic redesign – something altogether more compact? With 434,000 staff, the civil service is the smallest it has been since the Second World War. That’s down from half a million when the coalition came to power. e. Well there are fears in some circles that too few, rather than too many, are staying within the civil service; that “institutional memory” – and experience at how to pull the levers of power – is being lost. More than a quarter of the 3,700 senior civil servants who were employed at the time of the last election have been lost. In some departments more than a third of senior civil servants have moved on – including some of those at the Treasury who were involved in tackling the banking crisis. And – off the record – some senior civil servants are worried about the prospect of more rigorous “performance measurement” will have on the morale of the remaining staff. f. Broadly speaking, there is an acceptance for the need to cut numbers and for pay restraint. This even applies, grudgingly, for pensions reform but there is scepticism bordering on resistance to appraising staff in a manner which is similar to the system used in big private sector consultancies. There, it is argued, it is easier to assess individual performance because it is more straightforward to measure a member of staff’s ability to generate new business or profits. g. In the highly inter-connected world of Whitehall it is more difficult to judge who are the star performers, and who are seriously at risk of the sack. But clearly ministers do want a more robust way of deciding who should be candidates for the exit door as the civil service continues to shrink – albeit by a far smaller degree than Steve Hilton would like. Although there may be disputes over how to do this, ministers are also likely to want to bring in more leaders from the private sector and to put more civil servants on fixed-term contracts. h. The controversy over the Budget has put the advice being given to the ministers under the spotlight. Reforms of this kind date back to the Thatcher era and were also championed by Tony Blair. But insiders say that so far, the transfusion of new blood hasn’t always lead to a healthier outcome. Some newcomers go native; others leave in frustration. But less reported is the resentment generated by having employees who carry out similar functions on very different incomes. And the tax arrangements for some civil servants who were brought in temporarily from the private sector have already led to an outcry and swift reform. i. But the role of the civil service has really come into sharp focus since the post-budget “omnishambles” or to use the foul-mouthed term borrowed from BBC satire The Thick of It, which is in common parlance in Whitehall, “the clusterf**k”. Rows over tax changes affecting charitable donations, hot food (including, famously, pasties), pensioners and much more have pummelled the coalition. Some civil servants were blamed for not advising the government in advance of the potential pitfalls; others for putting forward potentially unpopular policies for ministerial approval. But civil servants aren’t the sole scapegoats for the shambles. k. Danny Alexander warned ministers not to “get in to the habit” of blaming civil servants when things go wrong. That’s probably good advice as ministerial attacks on the mandarins and government leaks appear to rise in direct proportion. Backbench Conservative MPs and some ministers instead blame “communications” at the heart of government for the recent troubles. Some special advisers are seen as not “political” enough or, bluntly, not competent enough. Some also say there is no strong “vision” coming from the centre. It remains to be seen if Steve Hilton’s departure makes that perceived problem better or worse. l. The coalition came to power determined to cut the number of special advisers, to give ministers their head, and to end the informal style of “sofa government” that was a hallmark of Tony Blair’s time in Downing Street. But behind all the headlines about the civil service or the omnishambles, you will find the number of political advisers is once again creeping up; that Mr Blair’s idea of a “delivery unit” in Downing Street is no longer mocked; that the centre is taking a closer interest in what the periphery gets up to. And that yes, No 10 does see the need to “get a grip”. And as part of that process, further – if limited – civil service reform is inevitable. a. The suggestion that the civil service could be cut by up to 90% is not the policy of the prime minister or “anyone else in Number 10”, the cabinet secretary has insisted. In what could be interpreted as a final swipe at David Cameron’s director of strategy Steve Hilton, who left Downing Street for California last week, Sir Jeremy Heywood said leaks to the press that suggested as much had “no authority whatsoever”. In the days leading up to Hilton’s departure stories appeared in the papers detailing proposals included in his final memo – claiming the government could make radical cuts to the Whitehall machine and slash a further £25bn from welfare. Hilton has taken a year-long sabbatical from government, and there continues to be intense speculation as to whether he’ll come back. c. Lib Dem chief secretary to the Treasury Danny Alexander alluded to the incident at a recent lunch for journalists, when he noted most people did not make such controversial proposals when leaving a job. “On their last day, they usually bring in a cake,” he said. There have been widespread reports of tension between ministers and senior civil servants in recent months. The perception that mandarins were blocking radical reforms desired by Hilton is said to have persuaded him to quit government. a. Relations between senior civil servants and Downing Street are at an all-time low, with both sides engaged in a bitter blame game over the Government’s recent political travails. One source yesterday described the atmosphere in Whitehall in the past month as “bloody”, with officials and politicians blaming each other for the failure to get the Government’s message across and clashes over plans for Civil Service reform. c. Another source of tension has been disputes between David Cameron’s combative head of strategy, Steve Hilton, and the Head of the Civil Service, Sir Bob Kerslake. Although he is leaving Downing Street at the end of this week, Mr Hilton has infuriated senior officials by departing in a blizzard of anonymous briefings. Sir Bob blames Mr Hilton for leaking details of a private meeting they held to discuss plans for Civil Service reform – due to be announced this summer. d. Mr Hilton is said to have walked out of the meeting after seeing Sir Bob’s proposals, which were described as “the kind of thing you would expect from a second-rate human resources department”. Mr Hilton is also believed to have referred to Sir Bob as “Bungalow Bob” and suggested he was trying to protect under performing civil servants from reform. Sir Bob is said by his supporters to have described Mr Hilton’s suggestion of cutting the central Civil Service by 90 per cent and outsourcing most of its policy work to think tanks and the private sector as “nonsense”. e. Mr Hilton was also accused of being unprofessional: turning up at the meeting in shorts and a T-shirt, clutching a plastic bag full of oranges. As the meeting went on, Mr Hilton is said to have started “inexpertly” peeling an orange, getting juice all over the “crotch of his brushed cotton shorts”. But Mr Hilton is not the only senior aide around Mr Cameron to have expressed anger at the performance of officials. f. The Prime Minister’s spokeswoman, Gabby Bertin, has been heard to complain at the poor service press offices in Government departments are providing Number 10 in identifying and promoting eye-catching initiatives to help the Government. But this is dismissed by senior civil servants. They describe the political appointees in Downing Street as “flailing around” with no sense of clear strategy and being led by the latest shifts in polling. h. Michael Gove; The Education Secretary’s disagreements with his Permanent Secretary, Sir David Bell, saw the department lose its most senior civil servant last year. Mr Gove is said to have been unhappy about the support he was receiving from officials and about what he believed were leaks orchestrated by pro-Labour staff. i. Francis Maude; Reported clashes between the Cabinet Office Minister and his Permanent Secretary, Ian Watmore, saw Mr Watmore quit only six months into the job. Mr Watmore – a former head of the FA – allegedly became “increasingly detached” after being undermined by the appointment of Sir Bob Kerslake as part-time Head of the Civil Service. a. Days before David Cameron’s most important party conference speech in five years, Steve Hilton surprised more than one member of the Prime Minister’s circle by “dashing back” to California for 12 hours. Mr Cameron’s influential former policy chief and long-time Svengali had been in the UK for barely a few days to help with the premier’s speech when he boarded a plane again. “He needed to be back in the States for something to do with Rachel,” says a friend, referring to Rachel Whetstone, Hilton’s wife and a senior Google executive who had also criss-crossed the Atlantic last week. “It was literally for about 12 hours, and then he came back again. b. He is extraordinary.” While in the UK, the couple even squeezed in two weddings – one was Wikipedia founder Jimmy Wales’s marriage to Tony Blair’s former aide Kate Garvey, the other between Hilton’s former deputy Rohan Silva and Kate MacTiernan. Amid all this transatlantic travel and church-hopping, Hilton was helping to craft Cameron’s speech. After leaving Downing Street earlier this year, he was always going to come back for conference, and he will return well in time for the next election campaign. While most of the speech had been written by last weekend, there was still some fine-tuning, mainly in response to Ed Miliband’s “One Nation Labour”. d. The Prime Minister’s address in Birmingham didn’t, as the BBC’s political editor, Nick Robinson, said, contain a “cor blimey moment”, as the Labour leader’s had. The “One Notion” riposte to Miliband’s “obsession” with borrowing more taxpayers’ money was effective. But the most memorable line was one that had Hilton’s fingerprints all over it: “I’m not here to defend privilege, I’m here to spread it.” It was the moment when Cameron appeared to tackle what insiders say has become one of his greatest problems: the lack of self-confidence that has crept over him this year. Ministers and aides have noticed a slump in the shoulders after unremitting bad headlines following the Budget. These have included his “LOL” text messages to Rebekah Brooks, revealed to the Leveson inquiry; Boris Johnson “owning” the Olympics in a way he never could; and the Andrew Mitchell “plebgate” saga. “He is in a funk, completely drained of confidence,” one minister said before the speech. And Hilton’s absence from No 10 has not helped. e. Now Cameron was declaring to the Symphony Hall in Birmingham, and to the wider world, that he was no longer afraid to be posh. The man embarrassed by his Bullingdon Club past, who fought shy of wearing a morning suit in the run-up to last year’s royal wedding, declared: “To all those people who say: ‘He wants children to have the kind of education he had at his posh school,’ I say: ‘Yes, you’re absolutely right.’ I went to a great school and I want every child to have a great education.” Cameron’s closest political friends have spent years briefing journalists that he was always “true to himself” – yet this major aspect of his background was repeatedly played down. f. Now he has publicly embraced it, as if to say: if Boris Johnson, another alumnus of Eton and the Bullingdon, can be popular, why can’t I? Of course, it is not Johnson’s schooling and university misadventures that make him popular. But Hilton, who is also on friendly terms with the London mayor, is thought to have developed the “spreading privilege” theme. It is exactly why Mitchell’s rant at Downing Street police officers came at such a disastrous time. One minister says the Mitchell affair made Cameron “the angriest I’ve ever seen him”, though he has in the past told friends he refuses to sack people on “hearsay”. h. Another close acquaintance of Cameron says: “They are in the middle of a dilemma about modernity. It boils down to the fact that the PM has no beliefs. Pretty well the only aspect left of the modernising agenda is gay marriage.” The impression that the right of the party is still calling the tune remains: the only concrete policies of the week were new laws permitting householders to “bash a burglar” and employee ownership plans that will erode workers’ rights. The dire economic situation hangs over everything, with one cabinet minister describing it as “hell”. i. Cameron may have restored some self-belief, but he returns to Westminster tomorrow with the same problems, including the Mitchell saga threatening to run into a fourth week. Downing Street is being blamed for allowing that row to continue. So a shake-up is quietly under way: Ed Llewellyn, Cameron’s chief of staff and one of his longest-serving aides, will focus solely on foreign affairs issues, while Oliver Dowden, a former member of the Conservative Research Department, will take over Llewellyn’s duties on the domestic front. There is also speculation about the future of the communications chief Craig Oliver after Michael Gove, the Education Secretary, was sent into the conference press centre to brief the media after Cameron’s speech. k. Negotiations will start between the Tories and Lib Dems for the autumn statement on 5 December, which will coincide with the signing of a new coalition agreement between the two sides, to bind them close together until the 2015 election campaign starts. For some, that campaign has already started: the Tory chairman Grant Shapps’s general election countdown clock may read 935 days to go, but he has devised a tightly honed “40-40” strategy – focusing on defending the 40 most marginal Tory seats and winning the most achievable 40 target seats. Significantly, party chiefs concede that “10 to 12” of these seats – possibly including Vince Cable’s Twickenham – are currently held by the Tories’ coalition partners. l. But will Cameron’s mission of “spreading privilege” help the Tories win that election outright? Bemoaning the fact that “we are in a very different world” because of economic turmoil, one Tory MP said: “Things are always going to be difficult, and the public aren’t going to be happy because they can’t afford two foreign holidays a year and they are worried about losing their jobs.” He’s surely right: they hardly feel like they’re on the receiving end of “privilege”. a. Hilton revealed to his students that the prime minister routinely left out of the loop as important policy changes are pushed through by “papershuffling” mandarins. Hilton, who was Cameron’s chief policy advisor but is currently on sabbatical, told students at Stanford University in California that the PM and his cabinet often find themselves powerless in the face of Whitehall bureaucracy and that they often learn of new policies only when they open the papers or listen to the radio. a. When Steve Hilton left Downing Street he regarded his friend David Cameron’s premiership as a disappointment. Hilton regarded Cameron as ‘reactive not transformative’. When he didn’t return at the end of his sabbatical, it was thought that was that. But for the last few days, Hilton has been back. When Cameron asked him to come and help on his conference speech, their old friendship kicked in and Hilton flew back from California. He was one of five people who hunkered down with Cameron at Chequers to work out how the Tory leader should respond to Miliband. With Hilton, Cameron and Michael Gove finishing each other’s sentences, it was like old times—a reminder of the energy of that 2005 leadership campaign. Though, Hilton will not be in Manchester this week. Hilton’s willingness to help out raises the intriguing possibility that he might be involved with the 2015 general election, after all. It is hard to see how Hilton’s impulsiveness would fit with the disciplined campaigns that Lynton Crosby likes to run. But the fact that Cameron asked Hilton to come back to help with this speech is a reminder that the Prime Minister thinks his old friend gives him something that nobody else can. The Tories’ attempts to erase their own online history are wider than first thought. After ‘cleaning up’ their website by hiding pre-2010 speeches and announcements, The Guardian’s Alex Hern reveals that the WebCameron videos have been made private on YouTube: ‘Now it has emerged that every video on the Conservatives’ YouTube page that dates from before 2010 has been removed or marked as private. Videos such as Ask David Cameron: Shared ownership, EU referendum, PMQs are now marked as unavailable on YouTube. Others, such as Boris Johnson at the pre-election rally in Swindon, and David Cameron down on the farm, are now unlisted, ensuring that only users with a direct link can see them.’ As Hern points out, they are still on YouTube if you know how to find them, as well as being archived on the Tory website. The demise of the WebCameron project says a lot about the fate of Steve Hilton’s modernization project. You may recall that Hilton, who was Cameron’s director of strategy until 2012, advocated ‘open source’ digital politics. Nearly all evidence of his work has been hidden or deleted by his own party. Hilton is unlikely to return to the Prime Minister’s side anytime soon to right these wrongs. Whispers around Westminster suggest that he’s enjoying life in California and looks on with frustration and dismay at how little Cameron is achieving in government. I’m sure that he’ll be even more dismayed that the Tories are now embarrassed by his efforts to detoxify their brand. So much for the so-called “Great Repeal Act” and Cameron’s promise to “sweep it all away” with which he lured us. He has turned out to be one of the biggest nannies of them all. A very slippery fellow. a. Lord Hill is to be appointed to a key role within the EU, delivering through his office, Financial Stability, Financial Services and the Capital Markets Union portfolio in the Juncker Commission. The newly-created Directorate-General will assimilate existing EU expertise and has responsibility for ensuring that the European Commission remains vigilant over banking and financial sectors and is pro-active in implementing new supervisory and regulatory rules accordingly, (exempt overseeing pay in the financial sector) which has been allocated elsewhere. He will be in post until 2019 and will be expected to bring change to the EU reforming marketing policies working hard cementing alliances so that the UK and EU achieve success. b. His introduction to the Tory government and subsequent elevation to high office within Europe is remarkable since he has never placed himself before the UK electorate for approval but perhaps the ever expanding appointment of ex advisers to cabinet posts reflects a continuing development of political Party’s in the UK. It is a fact that an increasing number of MP’s have never worked outside the Westminster machine taking up well paid, (through the public purse) advisory posts to ministers before being allocated safe seats allowing their progress through the ranks of the Party to high office. Ed Miliband and David Cameron entered politics this way. Of concern is the marked increase in the influence of Lobbying companies in Westminster and Europe and Lord Hill’s extensive links to private enterprise. a. Lord Hill has known Mr Cameron since they were advisers in Sir John Major’s government. He left front line politics after the defeat of the Tory government and co-founded the PR and lobbying firm Quiller Consultants, whose clients include, PricewaterhouseCoopers, HSBC Bank, the United Arab Emirates government, Telefonica O2, the controversial outsourcing company Capita, the right-wing think-tank Migration Watch and Tesco. b. Hill owned 50% of Quiller before it was sold to Huntsworth Plc for £5.9m in autumn 2006 — in a mixture of cash and shares, the latter of which appear on Hill’s entry in the Register of Lords’ Interests. Hill in consequence maintains an interest in Huntsworth’s massive network of communications businesses — including Grayling a leading Public Relations, Government Relations, Investor Relations and Events Consultancy with specialist services including CSR, environment and sustainability and digital. Operating from 54 offices in 26 countries worldwide across Europe, North America, the Middle East and Asia the company has revenues in excess of €100 million. A second company based, in London is Citigate a leading international consultancy specialising in financial and corporate communications. It’s mission is to ensure that clients engage to best possible effect with all relevant stakeholders across capital markets, government, business and consumers. Both companies also boast offices, “in the heart of Brussels’ EU quarter”. c. Quiller Consultants is led by Conservative peer Lord Chadlington and George Bridges, (a friend of George Osborne’s) who helped run the Tory Party’s 2010 general election campaign. Quiller also employs Stephen Parkinson, who used to prepare David Cameron for Prime Minister’s Questions, and Malcolm Morton, a former adviser to Cabinet office minister Mark Harper. The company has already been brought to book over their clients’ regular access to Conservative ministers – having employed one of the Chancellor’s mates in a leadership role at the company. d. International PR group, Huntsworth recently purchased another PR agency the Mmd Group for £12m. The company is a group of public relations businesses operating in 18 countries in Central and Eastern Europe. It was acquired from Anglo Irish Trust Company Limited for a total of £12m. The existing management team, under Chairman Alistair McLeish, will continue to operate the business following the acquisition. There is an earn out planned over the next three years which could result in a maximum total consideration of £35 million. g. The lobbying industry’s official register, published by the Association of Professional Political Consultants, states that Tesco was one of Quiller’s clients at the time and remains on the company’s books. Lord Hill had declared his shareholding on the Lords register of interests but not on the register of ministers’ interests. Lord Hill’s spokesman insisted that the Cabinet Office remained content that the peer’s shareholdings complied with the ministerial code, despite his move to a broader brief covering all government business. “He does have shares in Huntsworth,” the spokesman said. “When he became a minister at the Department for Education in 2010 he complied fully with all Cabinet Office advice and he continues in his new job to comply fully.” The spokesman said the ministerial code said it was not necessary to duplicate declarations already made on the Lords register of interests in the separate register of ministers’ interests. a. In July 2014, Prime Minister David Cameron nominated Lord Hill as UK European Commissioner under Jean-Claude Juncker, President-elect of the European Commission, hoping for a “top economic portfolio”. The nomination of Lord Hill rather than a better-known British politician, was regarded as controversial particularly since Hill had apparently expressed initial reluctance to go to Brussels. However two former Conservative Party leaders, Michael Howard and William Hague, both reportedly turned down the opportunity and David Cameron was keen to avoid triggering a potentially difficult by-election by nominating another sitting Tory MP. b. Juncker had stated after his election that female and high-profile candidates would be among his preferred choices, prompting speculation by some that Cameron’s nomination – of a virtually unknown male in European political circles, despite his competence – to be a protest against Juncker whose election he had opposed. On September 10, 2014 Lord Hill was announced as EU Commissioner-designate for the Financial Stability, Financial Services and Capital Markets Union portfolio in the forthcoming Juncker Commission. His newly-created Directorate-General will assimilate existing EU expertise and has responsibility for ensuring that the European Commission remains vigilant over the banking and financial sectors and is pro-active in implementing new supervisory and regulatory rules accordingly, save overseeing pay in the financial sector which has been allocated elsewhere. c. He was one of four appointees who “struggled to impress” at their initial confirmation hearings before the European Parliament, and who were required to appear for a second hearing — leading some hostile MEPs to start speculating that his commission could be revoked in a reshuffle. Hill was required to answer what the UK’s position is regarding European banking union, and to submit a completed questionnaire on behalf of the UK Government, and with Juncker helping to smooth the way, Lord Hill won the endorsement of the sceptical MEPs at his second hearing. d. The peer’s nomination will be presented by the prime minister to the European Council at a summit of the EU’s 28 national leaders in Brussels. If approved by the European Parliament, Lord Hill will serve a five-year term until 2019. The appointment was seen as an important indication of the prime minister’s strategy in Europe, with Eurosceptics in the Conservative Party urging him to pick someone who would take a tough line in negotiations. a. Lord Hill kept his head down as leader of the House of Lords so it is just possible you might not have heard of him. But his appointment is important. Lord Hill claimed recently he didn’t want the job, But today he said he was excited to play a part in reforming the EU. Jonathan Hill got the post because he is a highly effective operator and political insider. He ran John Major’s policy unit at Downing Street, he set up and sold a successful PR business, before returning to government under the coalition. He was also chosen because his departure would not prompt a risky by-election which the Conservatives might lose. b. Director General Simon Walker said: “Lord Hill has a track record of rolling up his sleeves and getting on with the job at hand, and his proven ability to deploy these skills within the machinery of Whitehall will serve him well in Brussels. “He is engaged with the business community and has a pragmatic approach to policy making, both of which are crucial to the UK being able to secure a significant economic portfolio in the Commission. The task at hand is to deliver reforms which will benefit Britain, as well as make the whole of the EU more competitive, flexible and growth-orientated. So Where is the Money Coming From George? Don’t Be Silly From the British Taxpayers of Course. 1. More problems, (other than the £4 billion annual cost of the war in the Middle East) for George to deal with in the next few weeks. All of which will be passed on to the taxpayer whether they agree with it or not. 2. George Osborne, (Chancellor of the Exchequer) in his autumn statement, for delivery to the country in November will announce an increase and extension of existing austerity measures. This will include a number of new cuts in welfare spending and public sector pay restraints, to last for the duration of the parliament and beyond. 3. But MP.s will take up their 11 per cent pay & expenses rise at the start of the new government in 2015. 4. Another bombshell, landing on the desk of the Chancellor is the report, (commissioned by the Speaker of the House, Mr Berkow) from an eminent group of building surveyors giving warning that the entire building is suffering from chronic and continuing deterioration due to subsistence. a. Big Ben is off the vertical by around 18 inches. b. Significant stress fracture cracks in the walls of the building. c. Boilers and piping systems are in very bad condition due to their age. d. Electrical wiring is badly in need of replacement due to fire risks and multiple safety hazards. e. Internally the Commons chamber itself also needs extensive work and at some point during the next Parliament will have to be shut for 18 months. MPs are expected to relocate to the Lords, with peers probably meeting in the QE2 conference centre opposite Westminster Abbey. 6. The entire programme of works will take between 10 and 20 years to complete and will be tackled in stages so as to reduce disruption. Projected costs vary but conservative estimates are between £4 and £6 Billion over 10 years. Note: Forward planning costs for such a large project is an art not yet perfected and the eventual total cost to the nation may well be in excess of £10Billion. 7. Both Houses agreed that doing nothing is not an option and an independent appraisal of a range of options is under way. The priority will be to ensure value for money for the taxpayer while safeguarding the heritage of the Palace. The final decision will be taken in the next Parliament. Author caltonjockPosted on September 28, 2014 September 29, 2014 Categories Tory PartyTags ToryLeave a comment on So Where is the Money Coming From George? Don’t Be Silly From the British Taxpayers of Course.